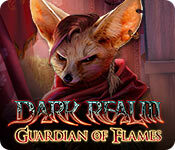 Dark Realm: Guardian of Flames is rated 3.6 out of 5 by 10. Rated 5 out of 5 by Shelly718 from Intelligence Resurfaces! Thank you MAD HEAD, for developing a game where I'm not led around by my nose like a five year old! How refreshing to find a game that has a coherent (albeit "out there") storyline, voice actors who can actually ACT, (not one of them said anything STUPID like, "gee, I might need a screwdriver here") and puzzles that aren't insulting to an adults intelligence. Puzzles are the only reason I buy these games and while these aren't difficult, they are fresh and unique, fun and challenging. My only negative comment is that it could have been longer, but I'm willing to sacrifice length for quality. I'm stunned at the poor reviews as I heartily recommend this game to anyone who wants to do their own thinking. Rated 5 out of 5 by zeldaqn from AWESOME What is WRONG with you reviewers? This game ROCKS. All aspects of the game are different than any other I've played and I own nearly 300 games from this site. The originality is not only refreshing but FUN. It reminds me of a Zelda type game. NEW AND REFRESHING. A MUST BUY. I now regret not getting the CE. Rated 4 out of 5 by ninja226 from Queen Valera's Justice League The story isn't great, but the artwork is awesome. Voiceovers are excellent. HOPs can be tricky. Puzzles are not hard, but does give your brain cells a good spin. The game is not very long, but enjoyable due to the beautifully done artwork, which is colorful, bright, super clear and sharp. Rated 4 out of 5 by clairepagan from Nice fantasy Good game in the series. Inventive game play. Good graphics and characters. Challenge is about medium on puzzles. It is very short however. I played the whole game in about 3 hours. Rated 4 out of 5 by pennmom36 from THE GAME AND FEATURES ARE AVERAGE BUT I LOVE THE STORYLINE OF DARK REALM Mad Head games never disappoint me, and right from the get go, this has been one of my favorite MH games as far as storylines go. The last couple of games in this series have been a wee bit too easy for my personal tastes, and some of the characters tend to be a bit hokey at times, but if you play this game from the beginning, I'm sure you will enjoy the storyline as well. This game is a solid game throughout, nothing spectacular, but decent enough. I purchased this game in the CE version during a 2 for 1 sale, however, this Standard Edition version is the better value, not just because of the price, but because the CE extras aren't worthy of twice as much money. Here's a recap of my review so you can decide which version, if either is right for you: Queen Valera is the last remaining Mage of the Firewielders, sworn to protect their world from evil, by harnessing the elements of nature to cast spells. The first Mage of the Firewielders, Erasmus, was the Master of eternal flame. Because of his unique abilities and life commitment, the Firewielder lineage became the strongest of all Mages. Erasmus was the only Mage capable of closing the seal that was breached, between our world and the Dark Realm, which allowed Azomond the Dark Lord to enter the Kingdom. The Dark Lord has been banished to the depths of the Dark Realm for a long time, long enough to gather an army of evil minions, and plan his next resurrection, Vae Victis! Yes, this story has been told a thousand times, in a thousand different scenarios, but somehow, Mad Head games was able to pull this one off, making the plot just interesting enough to play it for the 1,001th time. I Beta tested this game a while back, and they did change one Collector's Edition collectible, which was a colorful Leaf in the beta version, but is now a Jigsaw Puzzle piece. I'm not sure why they made this change, perhaps the colorful Leaf was too apparent, but I actually preferred the leaf over the bland jigsaw puzzle piece. I also found the graphics to be crisper and more colorful, than in the beta version. The Collector's Edition also offers a Morphing Object within the Hidden Objects Scenes, which is a feature I love, but hate when only offered in the HOP's, mainly because I get too wrapped up in the scene and forget to look for them, and you can't go back to find them once the HOS is over. 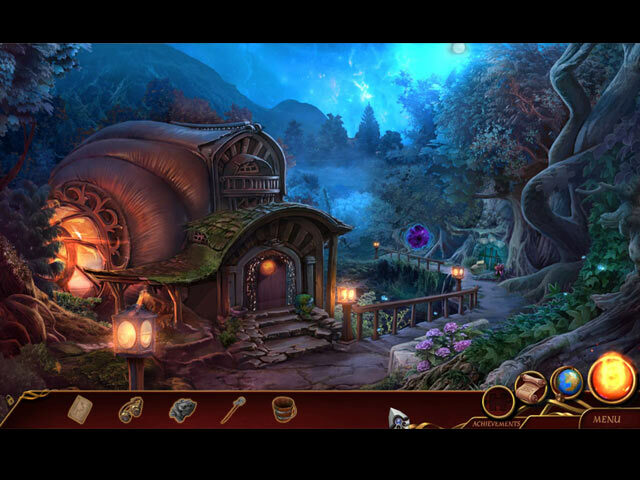 The Hidden Object Scenes are in classic Mad Head form, they always have the same style to them with the same music, but in a good way. Mad Head always has some interesting scenes with interesting interactions. A couple of my favorite scenes required interacting with trap doors, sliding figurines, and even opening a skeleton dinosaurs mouth to find different symbols, and another scene where you had to pick up items in one cubicle, open up another, and replace the items in three different drawer pull outs. There were also Interactive List Finds that left fragments behind to collect, finding 4 of each symbol on each page of a story, and even Spot the Difference between a painting and the scene itself. One scene I thought was actually challenging was finding valves and gadgets that matched the silhouetted shapes shown on a panel, and some of the valves were hard to find because there were so many similar shaped valves. Most of the HOS have a Morphing Object available which is another typical feature for Mad Head. The Mini Games are decent, and doable, ranging from super simple to medium difficulty. Below are brief descriptions of some of the games you'll encounter during the demo: 1) Recreate the constellations in the clue by selecting a point of light and placing it on an available spot. 2) Recreate the tiles based on the clue shown, using the press to to form and forge the tile pieces. 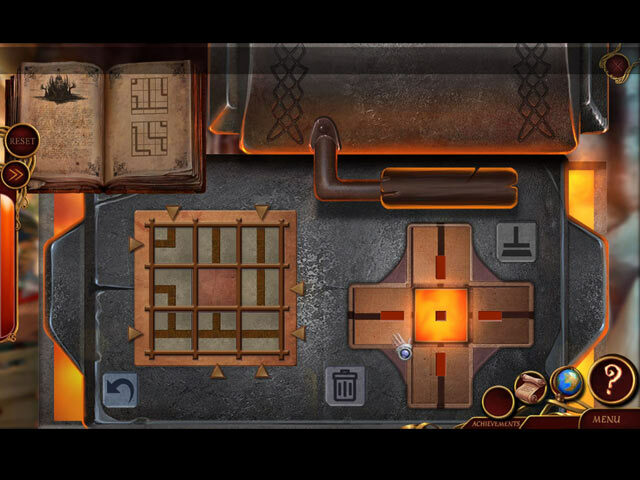 3) Use a map to navigate the labyrinth, using objects you find to interact with different tasks. 4) Repeat the sequence order of symbols as demonstrated. 5) Pick the lock by using rotational arrows. 6) Spot the difference between the painting and the scene. 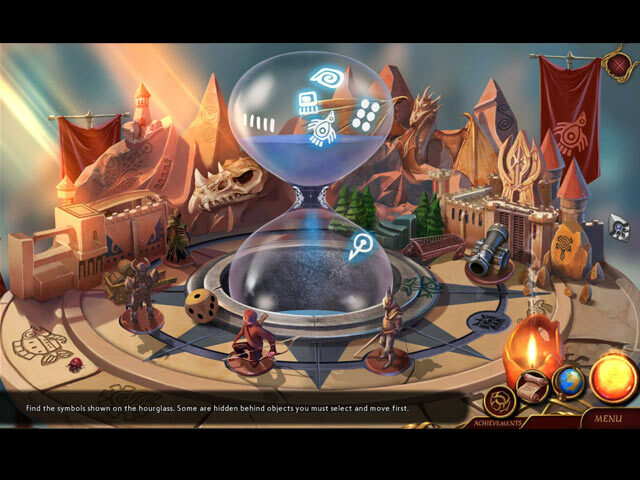 DARK REALM GAMES AVAILABLE Title***Collector's Edition Release Date***Average Rating -Guardian of Flames (CE 7-8-17) 4.0 -Lord of the Winds (CE 9-3-16) 3.7 -Princess of Ice (CE 8-15-15) 4.5 -Queen of Flames (CE 10-2-14) 4.6 The Collector's Edition has Wallpapers, Concept Art pictures, 13 replayable Hidden Object Scenes, 12 Achievements to earn, Collectible Jigsaw Puzzle pieces, Morphing Objects within the HOS's, a built in Strategy Guide and a Bonus Chapter, enjoy! Rated 3 out of 5 by Fooball from Couldn't wait to finish Most times I'm quite sad to reach the end of a game but with with this one I couldn't wait to get to the end. When I started I was happy with the graphics; really clear and well done but it all went downhill from there. There is too much storytelling and not enough gameplay for my liking. The mini games weren't much fun, the hardest part was working out what you actually had to do. The descriptions were hopeless. I found myself using the hint button over and over just to get to the end which is a bummer because like I said it LOOKED awesome. Rated 2 out of 5 by kodachini from unlogical story and just not fun The game was not fun for me at all. It looked really bad, especially the characters and little movie bits. The characters were not believable and strange. The story was really not logical. I can usually take a leap for the suspense of disbelief, but it was so bad I could not even do that... The only thing I was glad of was that I only downloaded the demo and had not bought the actual game.